James the Less is a figure of Early Christianity. He is also called "the Minor", "the Little", "the Lesser", or "the Younger", according to translation. He is not to be confused with James, son of Zebedee ("James the Great"). In most opinions he is the same person as James, son of Alphaeus and James, the Lord's brother ("James the Just"), but the sources offer no certainty. "Mary the mother of James" (Mark 16:1 and Luke 24:10). This "Mary" may have been Mary of Clopas (alternately Cleophas), mentioned only in John 19:25. 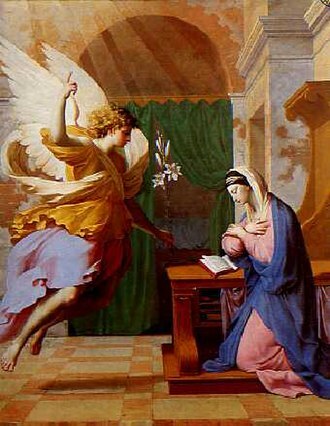 It is unlikely to be Mary the mother of Jesus since she is not identified as Jesus' mother but only called the mother of James the Less and Joseph/Joses. In Matthew 27:56 she is clearly distinguished from the mother of James, son of Zebedee. The title, "the Less", is used to differentiate James from other people named James. Since it means that he is either the younger or shorter of two, he seems to be compared to one other James. 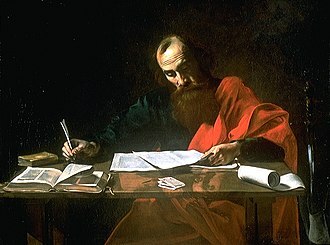 In the lists of the twelve apostles in the synoptic Gospels, there are two apostles called James, who are differentiated there by their fathers: James, son of Zebedee, and James, son of Alphaeus. Long-standing tradition identifies James, the son of Alphaeus, as James the Less. James, son of Zebedee, is then called "James the Great" (although that designation does not appear in the New Testament). Some propose that Alphaeus was the same man as Cleophas or at least the husband of Mary Clopas. The only conclusion is that the Mary who is described as the mother of James the Less was the wife of Alphæus and sister of Mary the Lord's mother, the one who is called by John the Evangelist ‘Mary of Clopas‘. Mary, mother of James the Less and Joseph, wife of Alphaeus was the sister of Mary the mother of the Lord, whom John names of Cleophas. In Roman Catholic tradition, James's mother is none other than Mary Cleophas who was among the women at the foot of the Cross of Jesus, weeping. For that reason, and given the fact that the Semitic word for brother is also used for other close relatives, James son of Alpheus is often held as a cousin to Jesus. He is also thought by some to be the brother of Matthew the Apostle, since the father of both was named Alphaeus (compare Mark 2:14 and 3:18). Thus, Jerome concludes that James the Less, James, son of Alphaeus and James the brother of Jesus are one and the same person. 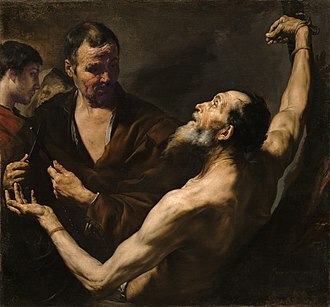 The same work adds "Simon Cananean and Judas Thaddeus were brethren of James the Less and sons of Mary Cleophas, which was married to Alpheus." ^ Jerome. "Fragment 15". The Perpetual Virginity of Blessed Mary. New advent. Retrieved 3 September 2015. ^ John Paul Meier, A Marginal Jew volume 3, p. 201. "There are no grounds for identifying James of Alphaeus - as church tradition has done - with James the Less." ^ saint, Jerome. De Viris Illustribus (On Illustrious Men) Chapter 2. newadvent.org. Retrieved 4 September 2015. ^ de Voragine, Jacobus (1275). 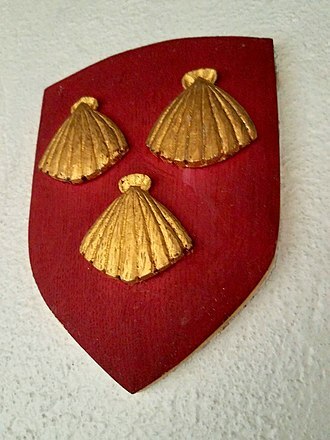 The Golden Legend or Lives Of The Saints. Retrieved 28 October 2018. ^ Stracke, Richard. Golden Legend: Life of SS. Simon and Jude. Retrieved 28 October 2018. 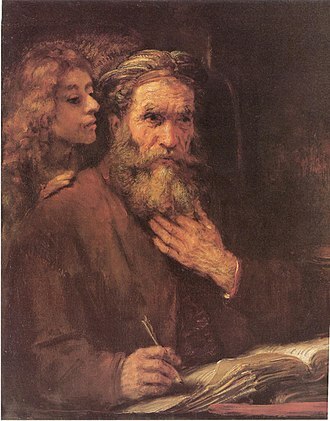 Andrew the Apostle, known as Saint Andrew and called in the Orthodox tradition Prōtoklētos or the First-called, was a Christian Apostle and the brother of Saint Peter. The name Andrew, like other Greek names, appears to have been common among the Jews, Christians, no Hebrew or Aramaic name is recorded for him. 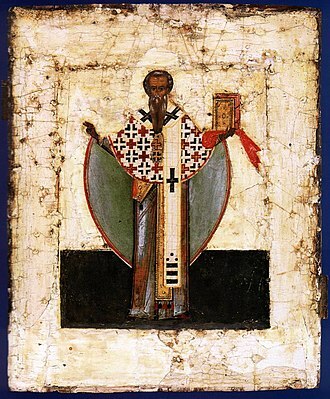 According to Orthodox tradition, the successor to Saint Andrew is the Patriarch of Constantinople. The New Testament states that Andrew was the brother of Simon Peter and he was born in the village of Bethsaida on the Sea of Galilee. Both he and his brother Peter were fishermen by trade, hence the tradition that Jesus called them to be his disciples by saying that he make them fishers of men. At the beginning of Jesus public life, they were said to have occupied the house at Capernaum. In the Gospel of Matthew and in the Gospel of Mark Simon Peter and these narratives record that Jesus was walking along the shore of the Sea of Galilee, observed Simon and Andrew fishing, and called them to discipleship. In the parallel incident in the Gospel of Luke Andrew is not named, the narrative indicates that Simon was not the only fisherman in the boat but it is not until the next chapter that Andrew is named as Simons brother. However, it is understood that Andrew was fishing with Simon on the night in question. Matthew Poole, in his Annotations on the Holy Bible, stressed that Luke denies not that Andrew was there. In contrast, the Gospel of John states that Andrew was a disciple of John the Baptist, whose testimony first led him, Andrew at once recognized Jesus as the Messiah, and hastened to introduce him to his brother. Thenceforth, the two brothers were disciples of Christ, on a subsequent occasion, prior to the final call to the apostolate, they were called to a closer companionship, and they left all things to follow Jesus. Subsequently, in the gospels, Andrew is referred to as being present on important occasions as one of the disciples more closely attached to Jesus. Andrew told Jesus about the boy with the loaves and fishes, Andrew was present at the Last Supper. The Golden Legend is a collection of hagiographies by Jacobus da Varagine that was widely read in late medieval Europe. 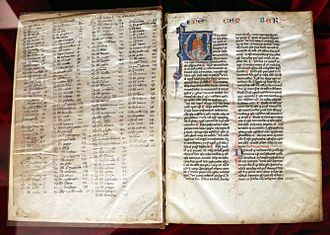 More than a thousand manuscripts of the text have survived and it was likely compiled around the year 1260, although the text was added to over the centuries. 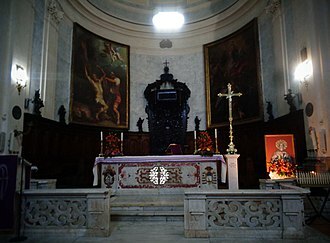 Initially entitled Legenda sanctorum, it gained its popularity under the title by which it is best known. 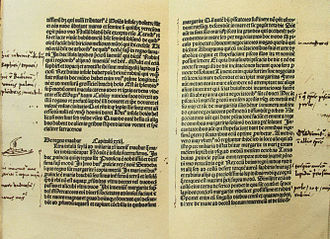 Over eight hundred manuscript copies of the work survive, and when printing was invented in the 1450s, editions appeared quickly, not only in Latin, among incunabula, printed before 1501, Legenda aurea was printed in more editions than the Bible. It was one of the first books William Caxton printed in the English language, Caxtons version appeared in 1483 and his translation was reprinted, in 1900, the Caxton version was translated by Frederick Startridge Ellis, and published in seven volumes. 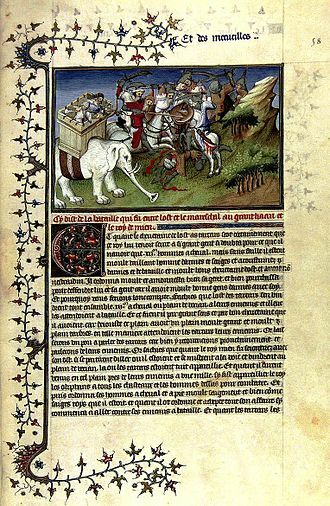 Jacobus da Varagines original was translated into French around the time by Téodor de Wyzewa. The book sought to compile traditional lore about all of the saints venerated at the time of its compilation, Jacobus da Varagine typically begins with an etymology for the saints name. 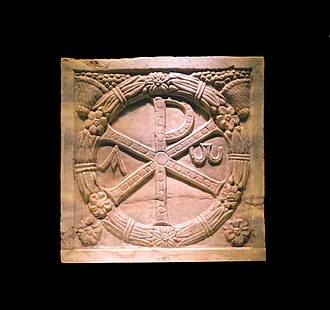 An example shows his method, Silvester is said of sile or sol which is light, and of terra the earth, as who saith the light of the earth, that is of the church. Or Silvester is said of silvas and of trahens, that is to say he was drawing wild men and hard unto the faith. Or as it is said in glossario, Silvester is to say green, that is to wit, green in contemplation of heavenly things, and that is to say he was cold and refrigate from all concupiscence of the flesh, full of boughs among the trees of heaven. As a Latin author, Jacobus da Varagine must have known that Silvester, the correct derivation is alluded to in the text, but set out in parallel to fanciful ones that lexicographers would consider quite wide of the mark. Even the correct explanations are used as the basis for an allegorical interpretation, Jacobus da Varagines etymologies had different goals from modern etymologies, and cannot be judged by the same standards. 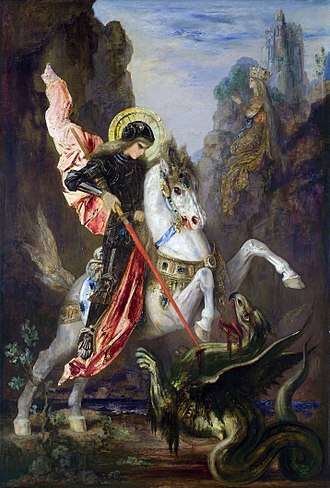 Jacobus etymologies have parallels in Isidore of Sevilles Etymologiae, in which linguistically accurate derivations are set out beside allegorical, the chapter conveys the limited medieval Christian understanding of the beliefs of Saracens and other Muslims. 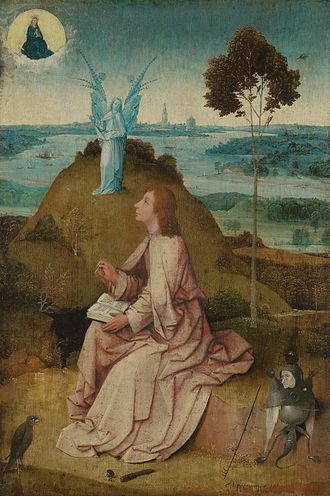 John of Patmos is the name given to the author of the Book of Revelation, the apocalyptic text forming the final chapter of the New Testament. 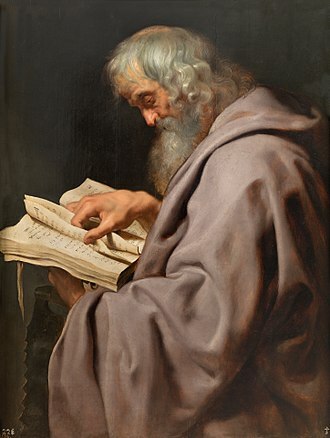 Traditionally, the writer of Revelation is widely considered to be John the Apostle, others identify the author as John the Elder and many modern scholars believe it was written by an otherwise unknown author, to whom they have given the name John of Patmos. The author of the Book of Revelation identifies himself only as John, this was often believed to be the same person as John, son of Zebedee, one of the apostles of Jesus, to whom the Gospel of John was attributed. The early 2nd century writer, Justin Martyr, was the first to equate the author of Revelation with John the Evangelist, the assumption that the apostle John was author of the Book of Revelation is now widely rejected in modern critical scholarship. John is considered to be exiled to Patmos, undergoing a time of persecution under the Roman rule of Domitian. Revelation 1,9 states, I, both brother and companion in tribulation. 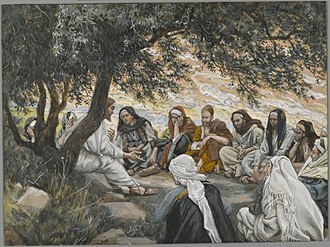 In the days following, Peter proposed that the assembled disciples, who numbered about one hundred and twenty, nominate two men to replace Judas. They chose Joseph called Barsabas and Matthias, they cast lots, and the lot fell to Matthias, so he was numbered with the eleven apostles. Matthias was present with the apostles at Pentecost. No further information about Matthias is to be found in the canonical New Testament, the tradition of the Greeks says that St. Matthias planted the faith about Cappadocia and on the coasts of the Caspian Sea, residing chiefly near the port Issus. 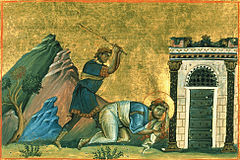 According to Nicephorus, Matthias first preached the Gospel in Judaea, an extant Coptic Acts of Andrew and Matthias, places his activity similarly in the city of the cannibals in Aethiopia. A marker placed in the ruins of the Roman fortress at Gonio in the modern Georgian region of Adjara claims that Matthias is buried at that site and he died at Sebastopolis, and was buried there, near the Temple of the Sun. Alternatively, another tradition maintains that Matthias was stoned at Jerusalem by the Jews, according to Hippolytus of Rome, Matthias died of old age in Jerusalem. Clement of Alexandria observed, Not that they became apostles through being chosen for some distinguished peculiarity of nature, but they were capable of becoming apostles on being chosen by Him who foresees even ultimate issues. 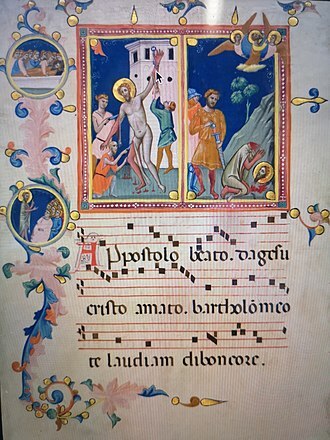 Matthias, who was not chosen along with them, surviving fragments of the lost Gospels of Matthias attribute it to Matthias, but Early Church Fathers attributed it to heretical writings in the 2nd century. The feast of Saint Matthias was included in the Roman Calendar in the 11th century, the Eastern Rites of the Eastern Orthodox Church celebrates his feast on August 9. 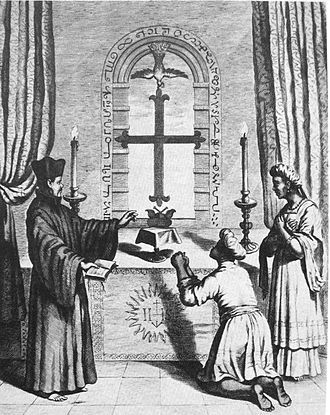 Yet the Western Rite Parishes of the Orthodox Church continues the old Roman Rite of February 24, the Church of Englands Book of Common Prayer liturgy, as well as other older common prayer books in the Anglican Communion, celebrates Matthias on February 24. 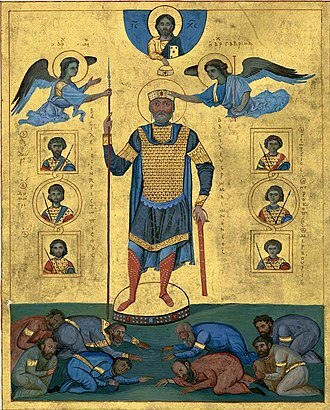 According to the newer Common Worship liturgy, he is celebrated on May 14 with a Festival, although he may be celebrated on February 24, if desired. Cleopas was a figure of early Christianity, one of the two disciples who encountered Jesus during the Road to Emmaus appearance in Luke 24, 13-32. Catholic and Orthodox traditions hold that Clopas, believed as brother of Saint Joseph, is the person with Cleopas. Others consider that Clophas and Alphaeus are all the same name, Cleopas appears in Luke 24, 13-27 as one of two disciples walking from Jerusalem to Emmaus. Cleopas is named in verse 18, while his companion remains unnamed and this occurs three days after the crucifixion, on the day of Jesus resurrection. The two have heard the tomb of Jesus was found empty earlier that day and they are discussing the events of the past few days when a stranger asks them what they are discussing. Their eyes were kept from recognizing him and he soon rebukes them for their unbelief and gives them a Bible study on prophecies about the Messiah. They ask the stranger to them for the evening meal. When he breaks the bread their eyes were opened and they recognize him as the resurrected Jesus and his friend hasten back to Jerusalem to carry the news to the other disciples, and learn Jesus has appeared to them. Judas Iscariot was, according to the New Testament, one of the twelve original disciples of Jesus Christ, and son of Simon Iscariot. He is known for the kiss and betrayal of Jesus to the Sanhedrin for thirty silver coins and his name is often used synonymously with betrayal or treason. Though there are varied accounts of his death, the traditional version sees him as having hanged himself following the betrayal and his place among the Twelve Apostles was filled by Matthias. 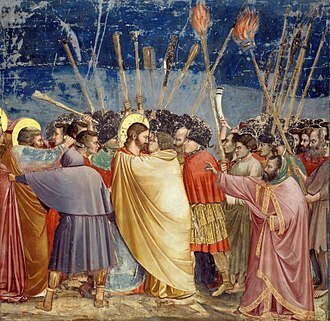 Despite his notorious role in the Gospel narratives, Judas remains a figure in Christian history. Gnostic texts – rejected by the mainstream Church as heretical – praise Judas for his role in triggering humanitys salvation, Judas is mentioned in the synoptic gospels, the Gospel of John, and at the beginning of Acts of the Apostles. Judas was a name in New Testament times. 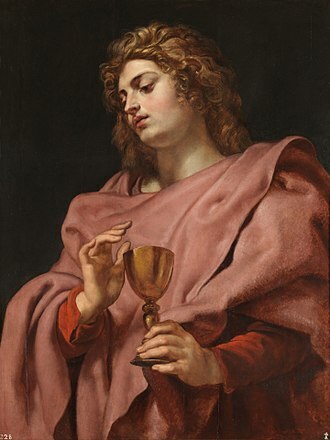 Judas Iscariot should not be confused with Jude Thomas, or with Saint Jude Thaddaeus who was one of the Twelve Apostles. Origen of Alexandria, in his Commentary on Johns Gospel, reflected on Judass interactions with the other apostles, Simon Peter spoke for the twelve, Lord, to whom shall we go. 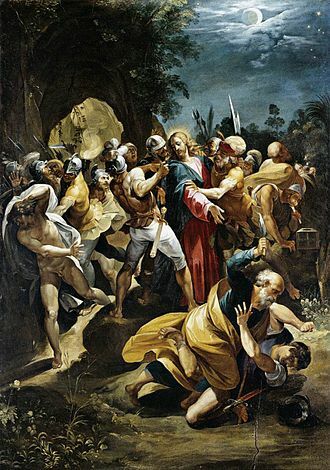 You have the words of eternal life, but Jesus observed that although Judas was one of the twelve whom he had chosen, marks Gospel states that the chief priests were looking for a way to arrest Jesus. They decided not to do so during the feast, since they were afraid people would riot, instead. According to Lukes account, Satan entered Judas at this time, according to the account in the Gospel of John, Judas carried the disciples money bag or box, but Johns Gospel makes no mention of the thirty pieces of silver as a fee for betrayal. However, in John 13, 27-30, when Judas left the gathering of Jesus and His disciples with betrayal in mind and they used it to buy the potters field. The Gospel account presents this as a fulfillment of prophecy, the Acts 1, 18-19 says that Judas used the money to buy a field, but fell headfirst, and burst asunder in the midst, and all his bowels gushed out. This field is called Akeldama or Field of Blood, the non-canonical Gospel of Judas says Judas had a vision of the disciples stoning and persecuting him. Mary of Clopas, the wife of Clopas, was one of various Marys named in the New Testament. The expression Mary of Clopas in the Greek text is ambiguous as to whether Mary was the daughter or wife of Clopas, Hegesippus thought that Clopas was the brother of Saint Joseph. According to some interpretations, the same Mary was among the women that on Easter morning went to the tomb to anoint Jesus body with spices. Matthew 28,1 calls her the other Mary to distinguish her from Mary Magdalene, while Mark 16,1 uses the name Mary of James, the Latin version of that name, Maria Iacobi, is often used in tradition. Stephen S. Smalley says that it is probable that Mary of Clopas is Mary the mother of James son of Alphaeus, for detailed explanations, please see, Brothers of Jesus and James the brother of Jesus. His sister and his mother and his companion were each a Mary, adding to the confusion, the Gospel of Philip seems to refer to her as Jesus mothers sister and Jesus own sister. An early tradition within the Roman Catholic Church identify Mary of Clopas being the sister of Mary the Mother of Jesus, eusebius of Caesarea citing Hegesippus records that Cleopas was a brother of Joseph, which makes Mary of Clopas a sister-in-law of Mary, the mother of Jesus. 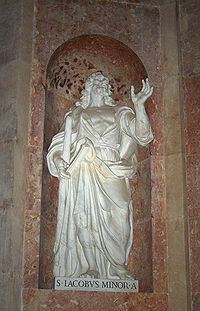 Statue of St. Simon in the Archbasilica of St. John Lateran by Francesco Moratti. 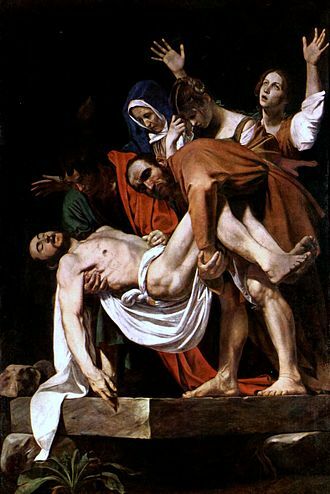 The hysteria of Mary of Cleophas in Caravaggio's The Entombment of Christ (1602). Along with Mary Magdalene and Mary of Clopas, Mary the mother of James is known as one of the Three Marys, depicted here by Mikołaj Haberschrack. A depiction of Cleopas as one of the disciples who met Jesus during the Road to Emmaus appearance, by Joseph von Führich, 1837.